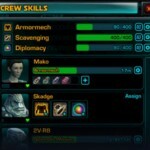 We’ve been hearing stuff all week about the new crafting system — now BioWare has made it official by adding the Crew Skills System page under the Game Systems tab. Bonus: a great video, “Crew Skills in Star Wars: The Old Republic,” which shows all kinds of companions we haven’t seen before, plus Dallas Dickinson confirms that players will be able to harvest their own mats if they really want to. See the Skills System page and watch the video here.